We all want white teeth. White teeth look healthy and are physically attractive. Especially in today’s day and age, when celebrities on TV and in the movies all have dazzling bright smiles, white teeth are in demand by all. Teeth are naturally an off-white color, but can become stained over time. While regular brushing and flossing get rid of most of the organic stains that occur on teeth, over time stains can build up. One of the most common causes of external staining is drinking dark liquids, such as coffee or tea. Smoking also causes heavy staining, resulting in teeth that appear yellowish or even dark brown. As a result, sometimes a professional approach is needed to achieve a natural-looking, brilliant, and dazzling smile, free of the effects of staining. Dr. Kederian always uses natural-based products to whiten teeth, which are very gentle and safe for both the teeth and gums. Whitening solutions work by opening up the tiny pores of a tooth’s enamel surface (called micro pores) so that organic stains on the external surface of the tooth dissolve, uncovering the natural white color of the tooth. Sometimes patients will have mild cold sensitivity after undergoing the whitening process for about 24 hours. This is a temporary effect that diminishes after the micro pores of the enamel close. Dr. Kederian offers several treatments for making your teeth look as stunning as you could possibly want. 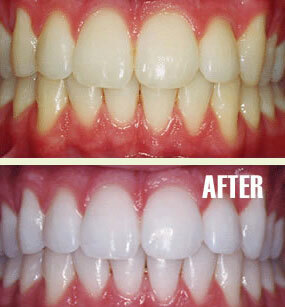 The most popular and effective method of bleaching teeth is an in-office treatment. This process usually takes an hour and a half. Dr. Kederian starts by placing barriers in your mouth to protect your gums and lips, and then applies a mild peroxide solution to your teeth, which is activated with a laser light. This process is very safe and easy. Most patients find themselves relaxed during this process, as they sit back watching a DVD and enjoying the massaging dental chair. The second most effective whitening process is a system of take-home bleaching trays. This may be used in conjunction with an in-office whitening treatment as an added step to maintain brilliantly white teeth, or can be used alone to brighten a smile. To make a bleaching tray, a mold of the teeth is created during the patient’s first appointment, and then a custom tray is made from the mold to fit perfectly around the teeth. Patients are instructed to fill the tray with the provided whitening solution and then wear the tray for 30 minutes a day for several days in a row. The process is simple and easy, and can be done before bed while watching television, or in the morning while reading the paper. It’s as simple as that! It is important for you to discuss your expectations with Dr. Kederian so she can evaluate the best whitening treatment for you. If you have any questions about teeth whitening treatments, do not hesitate to call Dr. Kederian’s office. We look forward to your call.